The purpose of this page will be to keep you updated on items that I am currently working on. Earlier in the year I completed multiple spot illustrations for a new textbook for National Geographic Learning – Reach for Reading. The first set of illustrations depict the creation of fog in the environment, very similar to the water cycle illustrations we’ve all seen in our elementary school textbooks. The major difference with fog is that water rises into the air as a vapor and as it quickly cools, so fog forms near the ground. The above illustration represents how fog is created in geographic locations such as Peru, which is covered in fog half of the year. In Peru, scientists designed a concept to gather the fog and use it to produce water for the villagers. They built special nets through which the fog would travel and capture tiny water droplets that would combine and drip into a gutter. The water was then designed to flow through pipes into tanks. What an amazing design solution! It was great working on these illustrations and creating realistic looking fog and desert scenes. Thanks so much to Jen & Hope for making the illustration process so easy and effective! eBay recently launched a new webpage through eBay Motors entitled Green Driving that features information about various fuel efficient automobiles as well as a database of vehicles for sale. I had the wonderful opportunity to work with them to illustrate 6 different fuel efficient automotive types: Electric, Hybrid, Diesel, Compressed Natural Gas, High Mile-Per-Gallon Gas Car and Ethanol. 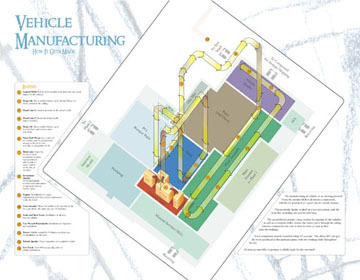 The goal was to illustrate the main components of the technology or process of refinery that allowed the automotive/fuel type to stand out from the mainstream internal combustion engine. The electric car was best illustrated as a comparison to our standard fuel vehicles to understand the advantages or disadvantages of this new automotive technology. 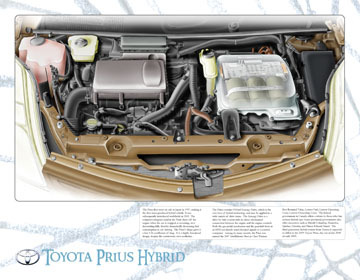 The above hybrid illustration is an information graphic representation of how a hybrid vehicle works. The three main components – engine, motor and battery work together at different points of acceleration and deceleration. The illustration provides a glance into which component is active at a certain point of drive time. The direct injection diesel illustration was created as an animation to depict a four-stroke engine comparison between a gas firing cylinder and a diesel injected cylinder. View this diesel animation here by selecting the “See how diesel cars work” button on the main image. The High Mile-Per-Gallon Gas Car depicts the numerous ways to maximize the efficiency of an existing internal combustion engine by altering certain engine features such as cylinder deactivation, turbocharging and direct injection. The above ethanol illustration is a depiction of the standard steps to refining the ethanol – from corn or other organic field materials to ethanol used to power an internal combustion engine. The Compressed Natural Gas illustration I felt was the most challenging to create the look of a compressed tank filled with a gaseous substance, yet it was also the most rewarding. My personal preference of vehicle choice would be to drive electric. How could you go wrong? No fuel, no oil, no upkeep. Check out the eBay Green Driving website to see which vehicle would best suit your lifestyle. Thanks to Brad for the overall vision of this project! Recently I completed a full page magazine illustration for Open Mind, a yearly periodical published by the Merit Contractors Association. It’s aim is to represent the interests of the open shop construction industry. The article was entitled “Building Information Modelling: Where Are We Now?” Building information modelling involves utilizing 3D modeling software to increase overall productivity from design concept through to the construction phase. The article reflected on how far technology has brought the construction industry. It was great working with AD Charles Burke on this project. Recently, I started a new website project called Brain Freeze Friday: Social Media Should Not Hurt the Head. On the site, I am discussing all types of social media and how small businesses, illustrators and photographers can use social media as a marketing strategy for their business. In the past year, I have worked with numerous companies and individuals executing social media plans to complement their existing marketing capabilities. Once a week, on Friday’s, I will be discussing a new social media topic (ie. blogs, Twitter, Facebook, Linkedin, Google+, etc.). In addition to discussing those sites, for Illustrators and Photographers, I will be reviewing various “free” portfolio sites that are available to showcase work, in addition to a business website. Check the website weekly or subscribe to the RRS feed to join in the discussion! I recently had the pleasure of working with Mirolin Industries Corporation on new marketing materials for their Snap Fit shower products. The illustration consisted of accurately showing how the Snap Fit system they manufacture works on their tub shower products. The biggest challenge with a technical illustration of this subject matter is rendering something that is all white, in a realistic fashion. I kept it simple with slight yellow hues for highlights and slight blue hues in the shadows to add some visual warmth to the illustration. Thanks to Jennifer and Daniel for making this project a success! It’s been a little while since I’ve had a chance to do an exploded view illustration for a client and this one for Mirolin Industries Corporation was interesting. We illustrated it in full color to realistically match the actual components. The exploded view of the shower door is done as an isometric illustration with callouts to specific items to show further details for the consumer piecing it together. Thanks to George for his vision and direction on this project. I recently completed this technical illustration for a 10 foot wide banner of an office building. With a quick turnaround of just over a week, it was great to see how this project developed from sketch to final art so quickly. The cutaway building shows the many mechanical components, as well as building technology systems. The challenge with this type of an illustration is showing all of the elements required while maintaining consistency so that no piece stands out as more important than another. Thanks to Elicia at Elemental for making this project come together in such little time! I’ve been working on a large number of projects lately, mostly technical illustrations. But, once in a while, it’s nice to work on other types of projects. This latest design piece is a logo and business card for a new plumbing company. There are so many visual references to plumbing that can be used with typography. It made my job easy! If you live in the Greater Toronto area and need a Plumber, make sure to give David a call. He’s great to work with! As another year winds down, I realize how blessed I am to have been able to work with some amazing clients this passed year! This year’s Christmas card concept was inspired by the use of an electric motor. Enjoy! I wish you all the best of the holiday season wherever you may be! One of my latest automotive illustrations is a tractor trailer that was created for the Union of Concerned Scientists. They are a leading science-based organization in the United States that work towards a healthy and safe environment. This latest project was to illustrate a tractor trailer that features multiple elements that would allow future long-haul trucks to be more fuel efficient. The UCS Convoy contains features such as a rear drag device, gap seal and side fairing which make the vehicle more aerodynamic and allow the potential for fuel savings and cleaner air. The phantom view of the illustration reveals the improved engine and transmission as well as a battery, which allows the potential for hybridization and idling reduction. 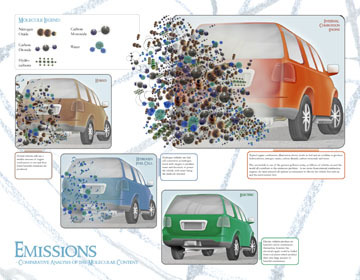 It was interesting to learn more about the long-haul vehicle features and a pleasure to work with Don Anair of the Clean Vehicles Program on these illustrations. The latest promotional postcard I’ve created focuses on my skills as a Technical Illustrator, as well as my ability to come up with some great ideas. I used a play on the word “spring” to focus on the fact that although I can accurately draw technologies and components, if a great idea is required, I also think and plan out each illustration that is created. Springs are found in so many household objects and mechanical technologies. Although this promo is a simple concept, springs can be one of the most challenging elements to draw accurately! To view more of my recent portfolio pieces, go to www.leannekroll.com. I have recently completed multiple technical illustrations for Smiths Detection, a company that provides cutting-edge technology products to security experts and governments for threat detection. The illustrations include technology used as security screening devices in prison institutions, such as metal detectors, x-ray machines, etc. A separate sterile room (above) is entered by one individual at a time and they are not allowed clearance from the room until a guard allows it. Multiple screening devices are utilized to guarantee that no weapons, contraband or other devices are transported into the institution illegally. Working with Smiths, they required multiple versions of the sterile and non-sterile illustrations, swapping out various technologies for each. I utilized an isometric viewpoint in order to save my client time and money in the production of these pieces. Recently I had a chance to attend the Body Worlds exhibit that was held at the Ontario Science Centre in Toronto. The exhibit was only open to artists for an evening of drawing the anatomical specimens on display. This exhibit looked in detail at the story of the heart and how it is one of the major organs in the body. One of the pieces on display was a replacement heart, developed to transplant into humans as a self-sustaining unit that works with all other existing organs. Based on a sketch I began that evening, I have completed this technical illustration on the AbioCor replacement heart. The AbioCor system also has external components that provide power to the internal components above. All of these items are placed within the chest and abdomen. The AbioCor heart was successfully implanted in 2001, making medical history. It is an amazing feat in technology! It is through this exhibit, that I now look at the cardiovascular system is a whole new light! My latest promotional piece fuses mechanical components and household objects to depict the beauty of a peacock. There are 7 different objects or materials that are represented in this illustration from hardware to household items. Can you find them all? Here is a zoom-in view of the feathers to make the search a little easier. My challenge as a Technical Illustrator is to take detailed items and subjects and make them simple and sensible for the viewer. In this piece, I enjoyed using technical elements to illustrate an interpretive approach to such a complex creature! As a Technical Illustrator, one style of illustration that I work on is called Information Graphics. Typically, these include anything such as graphs, charts and maps. They are utilized to visually assist complex literature and allow a reader to decipher through the use of visuals, a better understanding of a subject. The Toronto Star, a local major newspaper where I reside, has a Map of the Week feature where they research certain items and post them into a map. Last week’s Map of the Week feature was on parking tickets issued in the City of Toronto in 2008 and they indicated only areas where 1,000 or more tickets were issued. As a trend, they realized that the top 10 locations with the most parking tickets were usually near large institutions such as hospitals or universities and colleges. I was rather fascinated with all of the research and information as they had documented it, but I felt that the map could have been pushed in a more visually interesting direction. So, I have interpreted my version of the parking ticket map of the week, focusing on locations in the downtown core of Toronto. Rather than focusing on documenting the exact address location of the infractions, I used a colour coded system to represent the quantity of tickets issued with the use of symbols that represent stacked parking tickets. This allows the viewer to visually recognize a larger quantity versus a smaller quantity of tickets. On the first level of viewing the map, one gets an overall idea of how many parking tickets overall were written in downtown Toronto in one year. If the viewer wants to delve deeper, as they zoom into the map, street locations, as well as exact quantities in each location is revealed. Living in Canada is sometimes a challenge to the testament of one’s emotions and only those who have lived here can truly know what I mean. It is with this idea that my recent personal project is a foray into the sentiments of being Canadian in February. Although I have been kept busy this New Year with freelance projects, I felt it imperative to expand my illustration “bubble” and push myself to be more creative, with a side personal project. Sometimes the hardest decision we make as an Illustrator is “what to draw?” Inspiration can seem challenging and it is that which propelled my latest idea. You see, being Canadian in February is challenging to the soul. Short days, cold weather, bleak skies, snow on the ground and if it has melted, brown ground below… It is hard to keep oneself motivated in times like these. And thus, I felt compelled to examine my emotions and day-to-day feelings for the month of February 2009. It actually seemed perfect… February had exactly 4 weeks or 28 days. I wanted to do something creative for every single day of the month that would reflect on how my day went or how I was feeling that day. All 28 days of abstract, conceptual paintings were then composed in a layered image to represent the four weeks of the month. A reflection of Week Two’s composite: I must have been more restless or stressed this week – the overall concentration of this abstract representation is a hurried, busy effect compared to Week One’s composite which has more details that are recognizable. Some might ask, what was the point of this? In a way, it was a challenge to think on another level creatively than I usually do each day. But quite simply, it challenged myself to reflect individually on each day as it unfolded. And in turn, I have grown creatively as a technical illustrator. I was inspired a couple of months ago by an article I read in Wired Magazine. The article debated the opposing side of environmental issues which have begun to consume society lately. In it, there are 10 points which are debated and they all contained some type of statistical information. There were no illustrations accompanying this article. For my current project, I will be going through all ten debated topics and illustrate them in some form. With so many statistics involved in this information, an information graphic style would suit the context the best. In the next couple of weeks I will be posting the results of this project, as well as the paragraph from the magazine. I chose to illustrate this phrase by creating an icon of a vehicle and depicting the masses of traffic to an extreme. It is almost overwhelming to the eyes. However, it allowed a simple question to form at the centre asking Why Commute? The image of why commute at the centre is a reflection of all the other vehicles moving towards a common centre. Recently I completed this exploded view illustration for the Toronto Transit Commission. The illustration is the Low Voltage Power Supply (LVPS) unit for the Articulated Light Rail Vehicle (ALRV). The streetcar receives a 600 volt from the overhead power line as it drives. It is the purpose of this LVPS unit to convert the 600 volts into 36 volts of usable power for certain items such as interior lights, certain devices and controls. This illustration is incorporated into the TTC Training Department’s maintenance handbook which allows information to be better depicted for those learning how to fix and/or troubleshoot various components of the streetcars. After two quick weeks of painting in acrylics, I have accomplished my final painting of the VW Engine 1.4 TDI 80hp. My original intent was to push the limits of colour and realism with a technical illustration and work outside of the box. Although the engine is still realistically depicted in shape, I had fun combining bright colours to give this engine its own personality! One of the final challenges with doing this style of traditional painting and then using digital linework to hold it all together, is lining up the original vector linework. If you are interested in how I tackled this illustration, please view my process posts and I documented my steps of the painting. Upon completion of this technical illustration of the VW engine, three pieces will be utilized for a gallery show which is coming up in the next couple of weeks. The final gallery pieces as well as information about the show will be posted in the next couple of days. Leanne Kroll has two weeks to get this major technical illustration painting done for a gallery exhibit that she is in and time is of the essence. I am traditionally painting this VW Engine in vibrant colours. I will be posting my process throughout the two weeks for you to see how I move on this project. Previously I posted the digital linework that I had drawn of the engine. My second major step was to take a print out of the digital linework and create a transfer with a matte medium that would allow me to use my digital linework as the basis to my painting. Thus, I would be able to maintain a tight technical detail with a loose painting style. A task such as painting something so detailed could be a major challenge to the typical viewer. However, I like to tackle each element separately from the beginning so the task doesn’t seem so daunting. I complete each element separately, then move onto the next. In the end, I will paint the overall highlights and shadows that will bring the whole piece together. The following is the next step in my painting process. I worked on this next phase over a couple of days, two or three hours here and there. I spent quite a few hours in one day painting the next stages. My plan now is to do a little bit more tonight, then hopefully one last day and the main colour portion will be complete. When I am done painting all the main pieces, I plan on bringing in my highlights and shadows with a wash-style technique. Right now each piece is 3-dimensional unto itself, but to bring out more overall contrast, highlights and shadows in relation to all pieces must be attained. Once all painting is complete, I will scan the large piece and utilize my original linework as I place it on top of the painting to hold all of the elements together. Please check back in the next couple of days to see the final version of the traditional painting prior to any digital linework being added. Any comments as I progress on this project are greatly welcomed. I just completed this portion of my most recent illustration as a personal project. I am currently working on a VW Engine. I originally wanted a technical piece to add to my portfolio, however I also had a desire to pick up a paint brush again. Most Technical Illustrators complete their colour renderings of an illustration on the computer these days and I wanted to work on my piece traditionally. I have recently completed the digital linework to this illustration. My next step in the process is to use a matte medium to transfer my linework from the printed page onto a board that I will the use to paint. I would like to use the linework as the basis to my traditional painting to allow a tight technical piece to still stand out. Through the use of bright colours, I hope to bring this engine to life! Check back in the coming weeks to see process on this piece as I progress. The following orthographics and isometrics have been completed recently for the D-truck manual I am illustrating. The first, is a conventional vehicle with a stake and rack style bed where the stakes can be removed from the vehicle and the truck body also becomes a flat bed to carry loads. This vehicle is shown with a crew cab. Next, I completed basic orthographics and isometrics for a dump truck. These illustrations will further be used as the basis for other illustrations in the manual. For example, indicating load in a dump truck. If a load is within 12″ of the top of ledge of the truck bed, then a cover must be used to secure the load. I have currently been working on some D-class vehicle illustrations for a manual that will inform drivers of generic information about these types of vehicles. Beginning with the basics, I have created orthographics of all sides of the vehicles. An orthographic depicts the an object from a straight-on view, usually producing top view, side views and end views. The following illustration is of a cab-over style vehicle. Quite literally, the cab where the driver and passengers sit is over the hood which holds the engine. Upon completion of all orthographic views, an isometric projection is completed. All angles in this type of illustration are based on a 30 degree angle. Parallel projection is used to fill in lines to create a 3D image. The main benefit to isometric illustrations is in its simplicity, as well as the advantage of viewing an item entirely as an equal. For example, if you were to take an illustration of a room and that room is drawn in perspective, the corner furthest away from the viewer will appear smaller. However, if an isometric view is utilized, all corners will be the same size and therefore there will not be on aspect that appears more important than another. In many ways, orthographic and isometric illustration takes one back to the basics of technical illustrating. It is the last minute push to get all the major deadlines done! I am currently finishing up the little design details that I am glad I worked ahead schedule-wise, in order to have luxury to not over-look the elements that make everything come together. My final thesis project is composed of six major illustrations on alternative fuel technology. First, I begin with the manufacturing process. I had limited reference for this portion of the thesis due to “trade secrets” in the automotive industry. Firstly, I completed a one-on-one tour of the Honda plant in Alliston, Ontario where I was able to ask as many questions as I could possibly come up with about the daily functions of the plant. During the tour I was able to quickly sketch as we walked and to put my thoughts together into a map which informs the viewer of the flow of manufacturing vehicles. 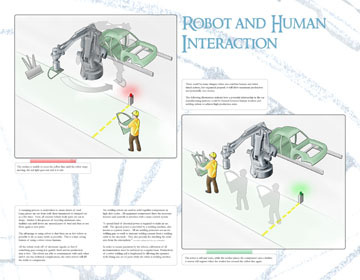 The second part of the manufacturing process in my thesis became more of a safety information graphic in the relationship between robot and human workers. Based on what I learned from the Honda Plant, I was able to prepare an illustration that reflected a time-delayed process where the robots and humans worked together. A component of metal was placed by the human on a stand which the arc welding robot would then pick up and weld onto the main frame of the vehicle. 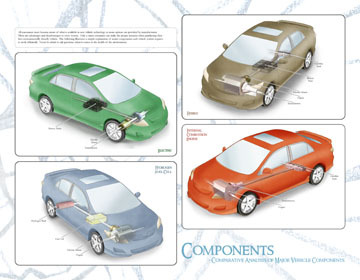 Another aspect of the alternative fuels thesis which I chose to illustrate where components of various vehicles. Thanks to Gerry Malloy, Automotive Journalist with the Toronto Star, I was able to gain numerous research photos of the Toyota Prius Hybrid Synergy vehicle. I chose to fully illustrate the vehicle components under the hood, with a phantom view of the Hybrid Synergy Drive. I began this illustration with a hand drawing of the major components. I then scanned in my drawing and utilizing my photo reference, filled in the missing “gaps” digitally. Using Adobe Illustrator for all the linework, I then brought the illustration into Photoshop and digitally painted with my Wacom tablet. As a comparative of various alternative fuel vehicles, I created an information graphic that illustrated the difference between internal combustion engine versus electric vehicle versus hybrid versus hydrogen fuel cell. Creating the main components of all four vehicles in 3D modelling software, I then created the exterior of the vehicle as a line drawing that I produced and painted digitally. The purpose of this illustration is to inform consumers of the vehicle options that are available at the moment. Another comparative illustration I create involved the same four vehicle types. This time I researched the molecular breakdown of the exhaust that is emitted from the different vehicles. Research included quantity, as well as the breakdown of molecule types for the four vehicles. Also, the typical scientific look for molecules as an issue in order to inform my appropriate audience. In the end, I modeled the molecules in Strata and then in Photoshop, pieced layers on top of layers to create my intended affect. My final thesis piece involves a political statement of the current view with alternative fuel technologies, in particular electric vehicles and the factors that play into where we stand as a society. These include government, car manufacturers, gas companies, coal manufacturing plants and consumers. We all play apart in what is happening now and where our environment is headed in the future. 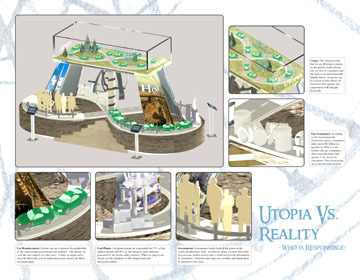 This final piece is a two-tiered information graphic as well as trade show booth intended for display to the public. It was modeled in Strata, a 3D modeling software. A good range of very nice work.